While hardly anyone mentions Senkaku Islands in Japanese Twitter any more, Chinese do not easily forget. With the leadership election coming fast, they need to wag the dog as well, I suppose. Chinese Vice Foreign Minister Zhang Zhijun didn't fail to mention "history", of course, and said China had to uphold their principles and bottom line. BEIJING - China on Friday said it will take forceful measures in response to any moves that challenge the country's bottom line on sovereignty. "We want to live in friendship with all countries including Japan, but we have to uphold our principles and bottom line," Chinese Vice Foreign Minister Zhang Zhijun told reporters Friday night. Zhang said China pursues a policy of friendship and partnership with its neighboring countries and stays committed to the path of peaceful development. "However, should anyone want to challenge China's bottom line on the issue of sovereignty, China will have no alternative but to respond forcefully so as to remove disturbance and obstacles and move steadily on the path of peaceful development," he said. Zhang said Japanese government's "purchase" of the Diaoyu Islands, which was announced on September 10, constituted a grave violation of China's territorial sovereignty. He said the move has caused "the most severe repercussions" on China-Japan relations since the two countries normalized diplomatic relations in 1972. The Diaoyu Islands are part of China's territory in accordance with historical fact and law, Zhang said. Japan has no right to buy or sell Chinese territory in any way and no transaction is allowed over even one inch of the Diaoyu Islands or anything on it, he said. Zhang said the "purchase" farce had been orchestrated by Japan's right-wing forces. The Japanese government, instead of doing anything to stop the right-wing forces from violating China's sovereignty and sabotaging China-Japan relations, has stepped in and "purchased" the islands itself. "What the right-wing forces had wanted to do and achieve was finally accomplished by the Japanese government," he said. The dangerous political tendency of the Japanese right-wing forces had once plunged Asia into a major disaster. Such forces, if not stopped but used, if encouraged and indulged out of domestic political needs, will become further emboldened and lead Japan further down a dangerous path, Zhang said. Some Japanese political figures have swaggered into the Yasukuni Shrine which honored WWII war criminals and paid tribute there without feeling guilty or ashamed, dismissing the feelings of the people in other Asian countries, which were victims of Japan's past aggression, he said. If Japan cannot face up to history, cannot examine its conscience and sincerely correct its mistakes, no matter how developed its economy is, it will never stand up morally or psychologically, he said. Swaggered into the Yasukuni Shrine which honored WWII war criminals? There are also soldiers who were drafted and died in the horrible battles, to whom the politicians in the entire National Diet should be apologizing forever. So the vice foreign minister says his country will respond with force to remove "disturbance and obstacles" (Japan and the Japanese) to achieve peace with neighbors. That makes sense. Akin to some country invading sovereign countries in order to spread peace and democracy. Speaking of "right-wing forces", the boy-wonder mayor of Osaka and ex-Tokyo Governor Ishihara will join forces. Just as expected. As his popularity plummets, Hashimoto needs a daddy figure in order to win big in the national politics. To call them "right-wing" is really an insult to the real right-wing (conservatives). They are statists, who genuinely believe in the power of the bigger, stronger government to do (them) good. Organizers say 100,000. Reuters say "tens of thousands", which is one order of magnitude bigger than the customary "thousands" when the media reports any protest anywhere in the world. Despite a minor recent setback of having been sentenced to 4 years in prison for tax fraud (and not likely to ever be in jail anyway), Silvio Berlusconi vows to take down the unelected prime minister who was installed by the EU troica of IMF, the EU and the ECB. (Reuters) - Tens of thousands of people marched through Rome in a "No Monti Day" on Saturday, some throwing eggs and spraying graffiti to protest against austerity measures introduced by Italian Prime Minister Mario Monti's government. Appointed in November when Italy risked being sucked into the euro zone debt crisis, Monti has pushed through painful tax hikes, spending cuts and a pension overhaul. "We are here against Monti and his politics, the same politics as all over Europe, that brought Greece to its knees and that is destroying half of Europe, public schools, health care," said demonstrator Giorgio Cremaschi. Some protesters threw eggs at bank windows and set off firecrackers, but no major incidents were reported. "United with a Europe that is rebelling. Let's get rid of the Monti government," read one of the banners held at the demonstration. Unemployment in Italy has risen to 10.7 percent, its highest since monthly records began in 2004, and unions are locked in disputes with companies over plant closures and layoffs. The nation's public debt is running at 126 percent of output, according to the International Monetary Fund. "It's been years that there have been no investments, instead it's all outsourced and privatized, we are here to say enough and we hope this voice will grow," said another demonstrator, Caterina Fida. Organizers said more than 100,000 people participated in the demonstration. Monti says he believes his technocratic government will be remembered for having helped Italy pull itself out of a deep economic crisis without needing to resort to external aid. Separately, some 20,000 doctors and nurses, wearing their white hospital gowns or uniforms, marked in another section of Rome to protest cuts to the national health service. "The entire system risks collapse if the cuts continue," one demonstrator said on television. In another demonstration in northern Italy, a small group of protesters scuffled with police near where Monti was addressing a rally on the theme of family values. For those of you for whom the 2-minute digest would suffice, here it is, while I download the 1-hour version. Again, the balloon flying operation to peek at the operation floor (5th floor) of Reactor 1 at Fukushima I Nuke Plant had failed once in August, and on October 24, Hitachi and TEPCO workers managed to fly a modified balloon to get past an obstacle that had foiled their previous attempt. I still wish they did the untethered drones instead, so that we get to see parts not close to the shaft in more details. 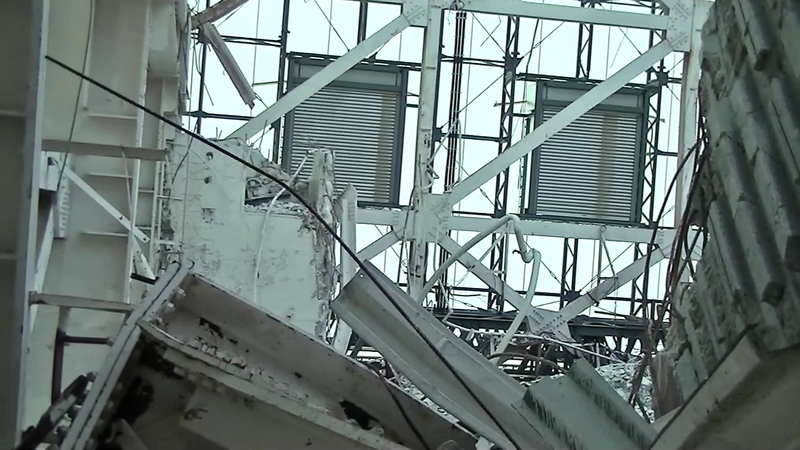 When a hydrogen explosion happened in the Reactor 1 building on March 12, 2011, the wall panels of the operation floor of Reactor 1 blew out (as they should), and the ceiling collapsed (as it shouldn't). Starting sometime in early October, TEPCO restricts the time period to make any full version of the videos that they take to only one week. The longer version of this balloon video, which I'm downloading right now, is available only up to November 1st. I already missed downloading the video of the Reactor 1 Containment Vessel probe video. Some transparency and openness after the takeover by the national government. (Reuters) - A contained radioactive water leak detected at EDF's Flamanville nuclear plant did not cause any damage to the environment or harm any employees, France's nuclear safety watchdog ASN and EDF said on Thursday. The nuclear safety agency said on its website EDF had detected a leak in a water pipe that feeds the plant's reactor 1 primary circuit late on Wednesday. It was stopped and did not cause any radioactive contamination. The incident was defined as a grade 1 incident on the international nuclear event scale (INES), where the maximum 7 is the most severe. There were 66 Level 1 incidents in 2011 in France according to the ASN. The 1,300 MW reactor 1 has been stopped for maintenance and refueling since July 26 and was in the last stages of the restarting process when the leak occurred. Who could have known? The company missed both the top line (revenue) and the bottom line (profit). The share price of AAPL has barely moved after hours (considering the lofty price), currently trading at $602, down 7 dollars from the close. Apple Inc. (AAPL) reported profit that missed analysts’ predictions as customers held off on iPad purchases before the release of a new model. Profit rose to $8.22 billion, or $8.67 a share, in the fiscal fourth quarter, Cupertino, California-based Apple said today in a statement. That compares with $8.3 billion, or $8.75 a share, the average of analysts’ estimates compiled by Bloomberg. The company’s sales and profit forecasts for the current quarter also fell short of predictions. Apple sold 14 million iPads, fewer than the 15.3 million predicted by analysts in a Bloomberg survey, as customers delayed buying old versions before the release of the iPad mini in the current quarter. Apple’s stock was halted before the results were released. It had slipped 1.2 percent to $609.54 at the close in New York, and has shed 13 percent since reaching a record the week iPhone 5 went on sale, related partly to the company’s struggle to keep up with demand for the smartphone. First-quarter earnings will be about $11.75 a share on sales of about $52 billion, Apple said. That compares with analysts’ estimates of $15.49 a share on sales of $55.1 billion. Donation from electric power companies to his new party must be swelling by the minute. 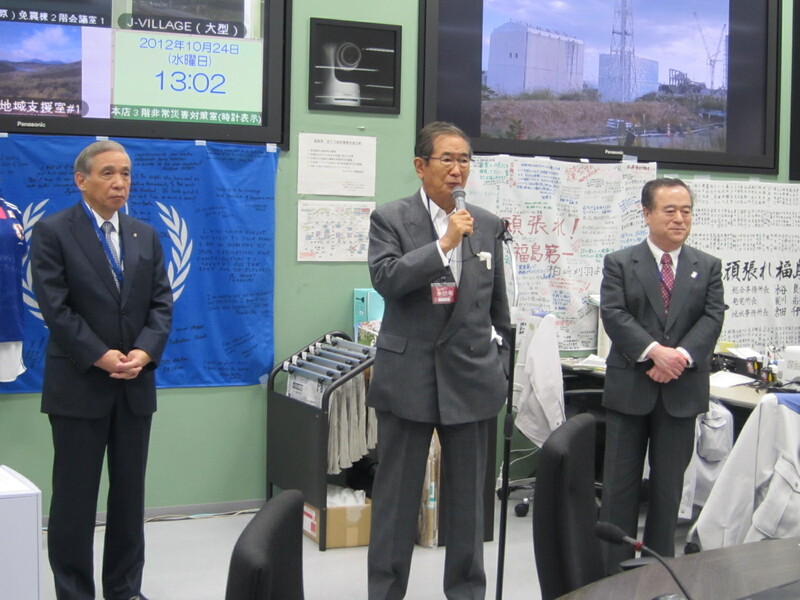 According to Jiji Tsushin (10/24/2012), Mr. Ishihara, who was still the governor of Tokyo at that time, made the remark in a press conference at J-Village in Naraha-machi, Fukushima, after he toured Fukushima I Nuclear Power Plant on October 24, 2012 in suits (without Tyvek) accompanied by the governors of Ibaraki and Gunma Prefectures. Governor of Tokyo Shintaro Ishihara, Governor of Ibaraki Masaru Hashimoto, and Governor of Gunma Masaaki Oosawa visited Fukushima I Nuclear Power Plant on October 24. After the visit, Mr. Ishihara emphasized the necessity of nuclear power plants to the press at J-Village in Naraha-machi, saying "There are points which we should seriously reflect upon, but to throw away the modern, new technology system created by the mankind just because of the accident is stupid." Jiji says Ishihara was referring to nuclear power plants, but I'm not so sure. He may have meant nuclear power plants, but given his ultra-hawkish stance on security issues he may have also meant nuclear technologies in general, including nuclear weapon making. Here's Ishihara, flanked by the governors of Ibaraki and Gunma, telling TEPCO managers and workers at Fukushima I Nuke Plant "You're doing the great job that only Japanese can do, with meticulous attention to detail", (according to the same Jiji article). Ishihara looks good for his age. After witnessing the devastation from the two atomic bombs dropped, there were many people in power in Japan who wanted to have such powerful weapons themselves. Maybe it had a similar impression on then-13-year-old Ishihara. Just when he has made a complete mess with the relationship with China over the Senkaku Islands, and when a questionable accounting of Tokyo's failed Olympic bid for 2016 starts to surface, he calls it quits. Governor of Tokyo Ishihara held an emergency press conference and announced that he would resign as the governor. "I resign as the governor as of today. I intend to return to the National Diet. I will form a new party with the like-minded people", he said. The press conference is still ongoing. Ishihara is probably quite popular with people whose source of information is the traditional media (TV, newspapers, magazines). The boy-wonder mayor of Osaka City, who is badly trailing in the polls but continues to be a media darling (good or bad), was in talks with 80-year-old Ishihara at one time about possible cooperation. Total 25 workers from Hitachi, 4 workers from TEPCO got the maximum 3.81 millisievert exposure for an hour and 40 minutes work on Wednesday October 24, 2012. TEPCO says they didn't use drones because the balloon was successful. Successful. The drones might have saved the workers from 3.81 millisievert radiation exposure. The balloon measured radiation levels on the way up the shaft. The level was highest on the 2nd floor, at 150.5 millisieverts/hour. 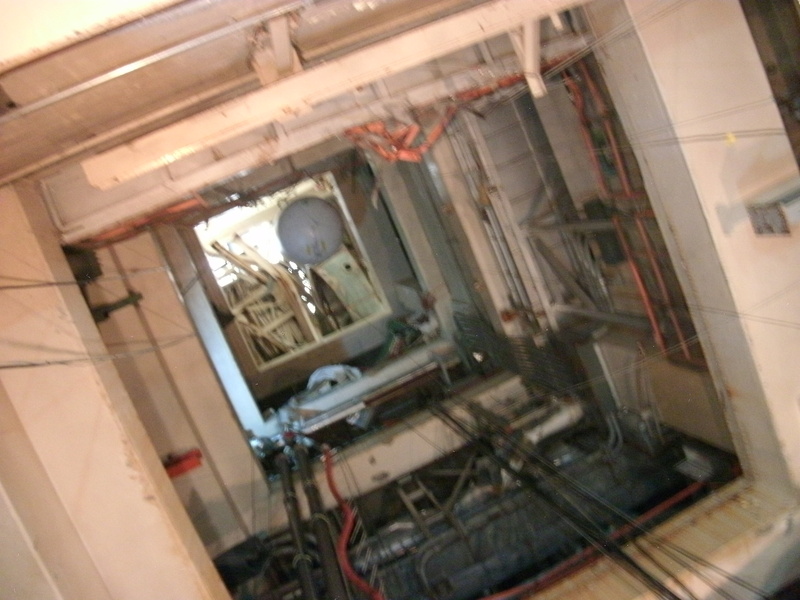 The operating floor (5th floor) was also high, at 53.6 millisieverts/hour at 1 meter off the floor. Jiji Tsushin wondered in its article why the radiation level was so high on the 2nd floor. They seem to have forgotten that that's where more than 1 sievert/hour radiation was measured back in May last year. The survey meter went overscale. that "an Islamic militant group had claimed credit for the attack" via the emails from the State Department's Operations Center. That's in addition to the near-real-time footage taken by the Predator drone over the Benghazi Consulate as the attack was happening on September 11, 2012. (Reuters) - Officials at the White House and State Department were advised two hours after attackers assaulted the U.S. diplomatic mission in Benghazi, Libya, on September 11 that an Islamic militant group had claimed credit for the attack, official emails show. The emails, obtained by Reuters from government sources not connected with U.S. spy agencies or the State Department and who requested anonymity, specifically mention that the Libyan group called Ansar al-Sharia had asserted responsibility for the attacks. The brief emails also show how U.S. diplomats described the attack, even as it was still under way, to Washington. U.S. Ambassador Christopher Stevens and three other Americans were killed in the Benghazi assault, which President Barack Obama and other U.S. officials ultimately acknowledged was a "terrorist" attack carried out by militants with suspected links to al Qaeda affiliates or sympathizers. Administration spokesmen, including White House spokesman Jay Carney, citing an unclassified assessment prepared by the CIA, maintained for days that the attacks likely were a spontaneous protest against an anti-Muslim film. While officials did mention the possible involvement of "extremists," they did not lay blame on any specific militant groups or possible links to al Qaeda or its affiliates until intelligence officials publicly alleged that on September 28. There were indications that extremists with possible al Qaeda connections were involved, but also evidence that the attacks could have erupted spontaneously, they said, adding that government experts wanted to be cautious about pointing fingers prematurely. U.S. intelligence officials have emphasized since shortly after the attack that early intelligence reporting about the attack was mixed. Spokesmen for the White House and State Department had no immediate response to requests for comments on the emails. The records obtained by Reuters consist of three emails dispatched by the State Department's Operations Center to multiple government offices, including addresses at the White House, Pentagon, intelligence community and FBI, on the afternoon of September 11. The first email, timed at 4:05 p.m. Washington time - or 10:05 p.m. Benghazi time, 20-30 minutes after the attack on the U.S. diplomatic mission allegedly began - carried the subject line "U.S. Diplomatic Mission in Benghazi Under Attack" and the notation "SBU", meaning "Sensitive But Unclassified." The text said the State Department's regional security office had reported that the diplomatic mission in Benghazi was "under attack. Embassy in Tripoli reports approximately 20 armed people fired shots; explosions have been heard as well." The message continued: "Ambassador Stevens, who is currently in Benghazi, and four ... personnel are in the compound safe haven. The 17th of February militia is providing security support." A second email, headed "Update 1: U.S. Diplomatic Mission in Benghazi" and timed 4:54 p.m. Washington time, said that the Embassy in Tripoli had reported that "the firing at the U.S. Diplomatic Mission in Benghazi had stopped and the compound had been cleared." It said a "response team" was at the site attempting to locate missing personnel. Other addressees included intelligence and military units as well as one used by the FBI command center, the source said. Salute to Soviet Submarine Commander Vasili Arkhipov. If he hadn't said "no" to the launch of Hiroshima-size nuclear torpedoes against the US fleet above, the world would have been a vastly different place by now (if the world had survived, that is). FOR thirteen days in October 1962, the world held its breath as the USSR and the USA stood on the brink of nuclear war. But a new documentary to be shown on Tuesday reveals that it was the actions of one man alone which saved the planet from utter destruction. Vasili Arkhipov, a Soviet submariner, died humiliated and outcast, despite single-handedly averting World War Three. Now, to mark the fiftieth anniversary of the Cuban Missile Crisis, Channel 5 documentary ‘The Man Who Saved The World: Revealed’ will tell his fascinating story. It begins in the midst of the 1960s Cold War paranoia, when relations between Washington and Moscow had all but collapsed. In America, ordinary people were stockpiling rations and building bomb shelters in their gardens, while in schools children were learning how to shelter under their desks. Then there was a revolution in Cuba, and the tension escalated. Now the USSR had a communist ally sitting right on America’s doorstep. Missiles stationed in Cuba had the ability to annihilate Washington and New York in ten minutes. The only thing stopping sworn enemies the USA and USSR firing on each other was the policy of mutually assured destruction. One torpedo fired by either side would get a mirror response from the other — triggering a shower of destruction that could wipe out human life. It was in this atmosphere of suspicion and fear that four submarines secretly set sail from Russia. Only a handful of the submariners on board knew that their ships carried nuclear weapons, each with the strength of the bombs dropped on Nagasaki and Hiroshima in 1945. The journey to Cuba was fraught with danger. Helicopters, aeroplanes and battleships were scouring the ocean for Russian subs. The American hunt for the Soviet submarines became a game of cat and mouse — and it wasn’t long before the mouse was spotted. Arkhipov’s sub, B59, was forced to make an emergency dive. As the submariners tried to stay hidden from their American hunters, conditions in the sub deteriorated. For a week they stayed under water, in sweltering 60 degree heat, rationed to just one glass of water a day. Above them, the US navy were “hunting by exhaustion” — trying to force the Soviet sub to come to the surface to recharge its batteries. They had no idea that on board the submarines were weapons capable of destroying the entire American fleet. Gary Slaughter, a signalman on board the USS Cony battleship, said: “We knew they were probably having trouble breathing. It was hot as hell in there, they were miserable, they were cramped together and they had been under great stress for a long time. The Americans decided to ratchet up the pressure, and dropped warning grenades into the sea. Inside the sub, the Soviet submariners thought they were under attack. Valentin Savitsky, the captain of B59, was convinced the nuclear war had already started. He demanded that the submariners launch their torpedo — and save some of Russia’s pride. In any normal circumstances, Savitsky’s orders would have been followed — and World War 3 would have been unleashed. But Savitsky hadn’t counted on Arkhipov. As commander of the fleet, Arkhipov had the last veto. And although his men were against him, he insisted that they must not fire — and instead surrender to the Americans. It was a humiliating move — but one that saved the world. The Soviet submariners were forced to return to their native Russia, where they were given the opposite of a hero’s welcome. It took years before the story of what really happened on the B59 sub was discovered — and by then, Arkipov was dead. But to his widow Olga, he was always a hero. Four Soviet submarines were sent on a mission known only to a handful of Communist party officials. Their destination was a mystery to be revealed once they were at sea. Under their orders, each submarine was to travel 7,000 miles from a top secret naval base in the Arctic Circle across the Atlantic to be permanently stationed in Mariel, Cuba where they would serve as the vanguard of a Soviet force a mere 90 miles from mainland America. The commander of each submarine had permission to act without direct orders from Moscow if they believed they were under threat. Each of the four subs was carrying what the Soviets called a ‘special weapon’, a single nuclear torpedo, comparable in strength to the bomb dropped on Hiroshima. The torpedo could only be fired if the submarine captain and political officer were in agreement. Each had one half of a key which, when joined, unlocked the firing mechanism. However, aboard the B-59, three men—not two—needed to be in agreement. As commander of the entire submarine fleet, Arkhipov had the power to veto firing the missile and was one of the only men who knew about the mission in advance. Courage of one person to say "no" saved the world. A lesson for us all. 3 microsieverts/hour radiation is 100 times as much as pre-nuclear-accident level in Fukushima. Tokyo - Government radiation monitoring in areas near Japan's crippled Fukushima nuclear plant is unreliable, Greenpeace charged on Tuesday, with heavily populated areas exposed to 13 times the legal limit. The environmental group said authorities were wasting time cleaning up evacuated areas and should prioritise decontamination efforts in places where people live, work and play. Greenpeace found that in some parks and school facilities in Fukushima city, home to 285 000 people, radiation levels were above 3 microsieverts (mSv) per hour. Japan's recommended radiation limit is 0.23mSv per hour. "We also found that official monitoring posts placed by the government systematically underestimate the radiation levels," said Rianne Teule, Greenpeace's radiation expert, adding that some machines are shielded from radiation by surrounding metal and concrete structures. "Decontamination efforts are seriously delayed and many hot spots that were repeatedly identified by Greenpeace are still there," Teule said. "It is especially disturbing to see that there are many hot spots around playground equipment, exposing children who are most vulnerable to radiation risks," she said. In tests carried out over four days last week, Greenpeace also found that radiation levels in Iitate village, where the government is hoping to soon return evacuated residents, are still many times over the limit, with decontamination efforts patchy. Greenpeace's Japan nuclear campaigner Kazue Suzuki said attempts to clean up were "misguided". "One home or office may be cleaned up, but it is very unlikely that the whole area will be freed of radiation risks within the next few years," given the mountainous and heavily forested nature of the region, she said. "The government continues to downplay radiation risks and give false hope [of returning home] to victims of this nuclear disaster," said Suzuki. A huge tsunami, sparked by a massive undersea quake, swamped the Fukushima Daiichi nuclear plant in March in 2011. Reactors went into meltdown, spewing radiation over a large swathe of Japan's agriculture-heavy northeast, in the planet's worst atomic disaster for a generation. The natural disaster left around 19 000 people dead or missing. However, no one is officially recorded as having died as a direct result of the nuclear catastrophe, but thousands of people have been displaced and many livelihoods wrecked. Scientists caution it could be decades before the plant is fully decommissioned and the areas around it are safe to live in again. Professor Hayakawa has also reported that the radiation measurement done at the monitoring posts in Fukushima differs, sometimes significantly, from the measurement done nearby. BRUSSELS — The European Commission, the executive arm of the European Union, said it will relax regulations on imports of Japanese food starting Nov. 1. The regulations were introduced in the wake of the nuclear accident at the Fukushima No. 1 power plant. During an interview in July, Maria Damanaki, EU commissioner for maritime affairs and fisheries, expressed the commission's willingness to loosen the restrictions, saying the danger of Japanese seafood "is around zero." The commission plans to reduce the frequency of sampling tests of Japanese food to 5 percent of import volume for all items from at least 5 to 10 percent. The EU has required Tokyo and 11 other prefectures across the nation to conduct tests on food before exports are shipped. It plans to limit the regulation to certain items about which safety concerns remain, including tea leaves and some kinds of mushrooms, for the 12 prefectures with the exception of Fukushima. I guess the EU does not know or chooses not to know that vegetables, meat, fish produced or caught in locations in Iwate, Miyagi, Gunma, Ibaraki, Chiba are being found with radioactive cesium exceeding the 100 Bq/kg safety limit of Japan or very close to it, and it is not last year but this year. However, since the EU import so little food supply from Japan anyway (9,000 tonnes from all Japan in 2010, says the EU), I suppose it is acceptable to the technocrats at the EU. Experts meeting in the Standing Committee on the Food Chain and Animal Health (SCoFCAH) endorsed a Commission proposal to revise rules on import conditions of food and feed originating from Japan following the Fukushima nuclear accident. Existing restrictions for food and feed imports coming from the prefecture Fukushima are maintained whereas control measures have been eased for several other prefectures. For the prefecture Fukushima, the existing measures applying to all food and feed, with the exception of alcoholic beverages, are maintained until 31 March 2014. Based on over 40,000 samples of products harvested in the second growing season after the nuclear accident, the restrictive measures in place have been eased for 11 prefectures (Yamanashi, Shizuoka, Gunma, Ibaraki, Tochigi, Miyagi, Saitama, Tokyo, Iwate, Chiba and Kanagawa). An interim review is foreseen before 31 March 2013 for crops where samples of products for the second growing season (March-November) were not available in time for this review. For the control at import, a reduction of the frequency of controls to 5% will apply. Based on the monitoring results from the 2013 growing season, it is foreseen to undertake a review of these measures shortly before 31 March 2014. The measures will be published at the end of this month following the adoption of the proposal by the Commission and are foreseen to enter into force on 1 November 2012. Well, we're no wiser. There is no mention of 8 food items, and I have little enthusiasm in delving into the EU press releases from last year. Maybe that's the wishful thinking of Yomiuri. According to the latest information, the Japanese authorities have taken the necessary measures to ensure that food (and drinking water) testing above their established acceptable levels of radio-activity is neither sold to the Japanese public nor exported. Well it was sold to the Japanese public. Yokohama City was busy last year feeding school children with radioactive beef because the business-minded mayor of Yokohama couldn't pass up a bargain of buying premier domestic beef at a discount. As for exports, the French authorities caught green tea from Shizuoka that had over 1,000 becquerels/kg of radioactive cesium. This year, green tea from Tochigi was found with 24 becquerels/kg of cesium, AFTER it was brewed, indicating the dried tea may have had 100 times that. Trivial details, for the political class. For $329, you can now buy a small tablet from Apple. For price-conscious consumers, there are Google Nexus or Amazon Kindle for $199. Or Samsung Galaxy. After the unveiling of iPad mini, Amazon shot up, and Google wasn't perturbed. Apple is set to announce its quarterly earnings on Thursday after market. TEPCO may be finally getting smarter. Or this could be the continuation of bath salts and diaper polymers - unique use of commonly available off-the-shelf products. 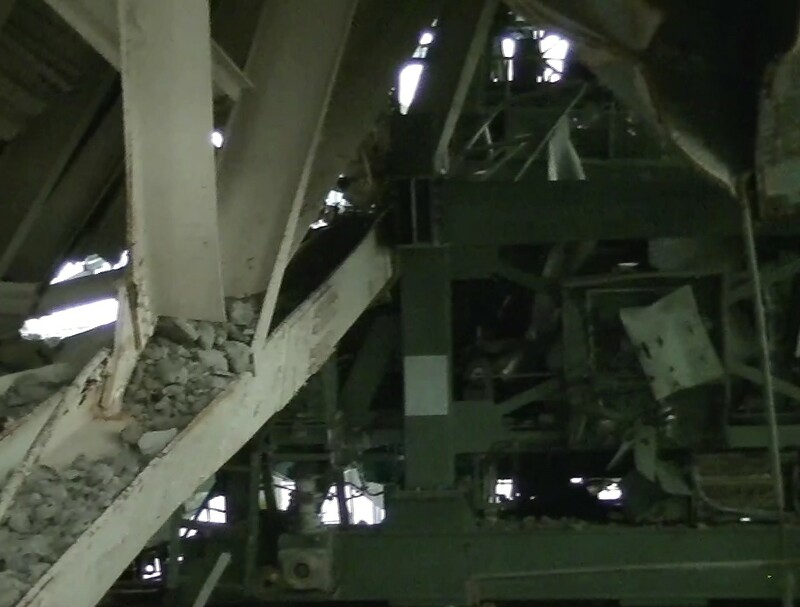 Anyway, TEPCO is redoing the survey of the operating floor of the Reactor 1 building at Fukushima I Nuclear Power Plant. When they tried it the first time in early August, the giant balloon they used got caught by an obstacle and couldn't go up to the operating floor. This time, they will still use a modified version of the balloon, but they will also have a backup plan which looks better to me than the balloon. TEPCO will have remote-controlled flying objects as backups, and one of them is the one that can be operated with android phone, iPhone or iPad. Welcome to the 21st century, TEPCO. 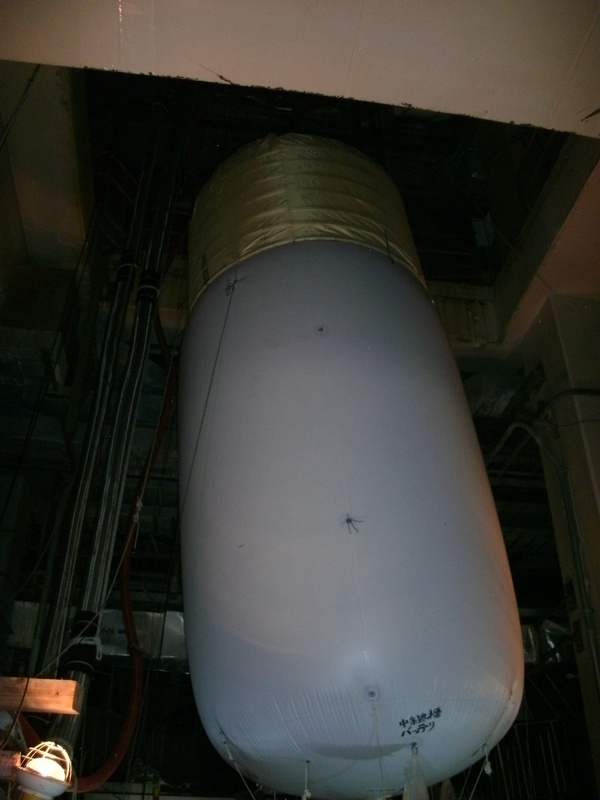 Unlike the "Plan A" with the modified giant balloon which will still require workers to be right inside the Reactor 1 building to feed the string attached to the balloon, the "Plan B" with the flying objects can be operated remotely, though the TEPCO's diagram shows workers inside the reactor building with no shield. I still personally like the idea of Professor Kumar of University of Pennsylvania to use a swarm of small flying objects that self organize. I guess it's still too radical for TEPCO to think of emergent intelligence when individually dumb or low-intelligence objects work together. This talk seems to occur periodically, but this time almost totally outside Japan. Several US websites have the scary articles, which read more or less "Confirmed: Reactor 4 is sinking unevenly, entire building to tilt". To Enenews who quotes Mr. Arnie Gunderson, who quotes Former Japanese diplomat Mr. Mitsuhei Murata, who quotes Mr. Mitsuyo Matsuda, a former secretary of Prime Minister Naoto Kan who quotes an anonymous "high ranking official in the nuclear security agency". I remember Mr. Matsuda from an interview done by independent journalist Yasumi Iwakami; I was rather taken aback with his assertions about Fukushima I Nuke Plant without anything to back them up. I was also surprised at Mr. Iwakami, for not questioning his assertions. Mr. Matsuda claims in this interview in June this year (by 8bitnews, set up by former NHK news caster Jun Hori) that Reactor 4 had a core melt (never mind that there was no fuel in the reactor pressure vessel at that time) that resulted in an "elephant's foot" like Chernobyl. He says "it's immediately apparent" if you look at the photo of Reactor 4. Japanese economy may have two consecutive quarters of contraction, which is the definition of "recession". DPJ's Seiji Maehara, whose ministerial portfolio includes economy, finance, nuclear policy, and national strategy (virtually eliminating the need for the cabinet), pushes Bank of Japan for more monetary stimulus. He is silent on 20-plus years of fiscal stimulus by the Japanese government that has gone nowhere. Imports increased more than anticipated, because "“Everyone rushed to pass customs,” before a tax increase on oil imports that began Oct. 1." Tax increase on oil imports, when the economy is struggling??? What are they thinking? Oh I see, they are worried about "global warming". Of course. So the tax on 1 kiloliter of crude oil went up more than 10% starting October 1, according to the information from the National Tax Agency. Japan’s exports fell the most since the aftermath of last year’s earthquake as a global slowdown, the yen’s strength and a dispute with China increase the odds of a contraction in the world’s third-largest economy. Shipments slid 10.3 percent in September from a year earlier, leaving a trade deficit of 558.6 billion yen ($7 billion), the Finance Ministry said in Tokyo today. The median forecast in a Bloomberg News survey of analysts was for a 9.9 percent export decline. Imports rose 4.1 percent. Economy Minister Seiji Maehara pressed the Bank of Japan for more action yesterday, saying the nation is “falling behind” in monetary stimulus and is at risk of another credit- rating downgrade. The BOJ today cut its view of eight out of nine regional economies while Taiwanese unemployment rose to a one-year high, underscoring weakness across Asia after China’s third-quarter growth was the slowest since 2009. ...The decline in shipments, exacerbated by a spat with China over islands in the East China Sea, was the biggest since May last year, when the country was rebuilding supply chains wrecked in the March earthquake and tsunami. Shipments to China, the nation’s largest export market, slid 14.1 percent from a year earlier. Exports to the European Union fell 21.1 percent, while those to the U.S. rose 0.9 percent. Auto shipments to all markets dropped 14.6 percent. ...The trade deficit was the first in the month of September since 1979 and compared with economists’ median estimate for a 547.9 billion yen shortfall. The rise in imports was higher than a 2.9 percent gain estimated by economists as the country bought more oil and liquefied natural gas. “The reason behind the increase is very simple,” said Shohei Setoh, a Tokyo-based manager for a crude oil trading group at JX Nippon Oil & Energy Corp. “Everyone rushed to pass customs,” before a tax increase on oil imports that began Oct. 1. A reader forwarded me an excellent essay about a small town in western Pennsylvania contaminated with uranium. Men, women, and children were poisoned by that uranium fuel plant and that glass plant. Yet, for the most part, they ignore this, content to contemplate instead their “warm and fuzzy” memories, as one person put it on my hometown facebook page. The town seems to be dying because of radiation contamination from decades of uranium fuel processing, but people would rather dwell on warm and fuzzy feelings. Apollo is a small town in western Pennsylvania, part of the old coal and steel belt that surrounds Pittsburgh. The shallow Kiskiminitas River, a tributary of the Allegheny, flows through the borough. Although it is close to my hometown, I never knew much about it, except that my artist uncle once made a glass carving for the town to commemorate the Apollo astronauts the community had embraced. I remember passing through Apollo and noticing a large industrial complex at the edge of town. Years later, I learned that this plant was owned by the Babcock & Wilcox Corporation, and it produced uranium fuel. Babcock & Wilcox, a global conglomerate, has been involved in nuclear-related industrial production ever since the Manhattan Project, designing, fabricating, and supplying components for nuclear power plants, ships, submarines, and weapons. The facility in Apollo and another one in nearby Parks Township, initially built by the Nuclear Materials and Equipment Corporation (NUMEC) in 1957 and later bought by the Atlantic Richfield Company (ARCO) and then by Babcock & Wilcox, closed in 1986. Left behind were contaminated land and water and sick and dead residents. Victims and their families sued the companies in the mid-1990s for damages suffered, and ARCO and Babcock & Wilcox were forced to pay $80 million to compensate victims for cancers and loss of property value. Sadly, by the time the lawsuits were settled, in 2008 and 2009, 40 percent of the claimants had died. Meanwhile, Babcock & Wilcox declared bankruptcy in 2000 to avoid liability in thousands of lawsuits by employees subjected to asbestos, a substance that businesses have known since the 1930s causes cancer. As a condition of exiting bankruptcy, it set up a trust fund to pay asbestos claimants; the amount of money put aside was far less than the company would very likely have had to pay if it had faced those lawsuits. A top official in 1974 viewed memos on the facility [which Babcock Wilcox bought in 1971] and wrote that if they were accurate, ‘we are guilty of gross irresponsibility in continuing to operate our uranium facilities.’ He threatened to shut them down, but the company didn’t stop making highly enriched uranium there until 1978, and it ended all production in 1984. The actions of these corporations helped to destroy a town and its people, and it appears they knew what they were doing. They not only located a nuclear plant in a town, but then failed to shut it down when they knew that workers and residents were being poisoned. “ ‘A lot of people have lost not only their entire savings but their homes,’ due to the health effects and loss of property value caused by the plants, said Patricia Ameno, of Leechburg, who sued the companies in a previous round of litigation . . . . ‘Their families have been torn apart by illnesses and deaths.’” Ms. Ameno, whose body has been wracked by cancer and brain tumors, added, “I saw the town I grew up in … disintegrating, just like the bricks on that plant.” One of the persons who posted a comment on the Post-Gazette article noted that a 1999 piece in the same newspaper showed that one-sixth of Apollo’s population had some type of cancer! I posted the Post-Gazette story on a facebook page dedicated to men and women who grew up in my hometown in the 1950s and 1960s. Most know about the Apollo plant. And they all lived in a town dominated by the Pittsburgh Plate Glass Company, which poisoned its own employees with asbestos and silica dust and whose now abandoned property is so full of harmful chemicals that it cannot even donate it to the town. Outside town, near the company-owned fields on which I used to play baseball, “waste lagoons” built by the company and fed by pipes that went under the river have been leaking “arsenic, chromium, lead, manganese, copper, zinc, mercury and other toxic compounds into the river.” Despite this, only two persons commented on what I posted. If a post concerns some ancient bit of trivia or the local hoagie shop, members of the group fall all over themselves to make some meaningless remark. But something so important is met with silence. Sadly, a family member is a manager at Babcock Wilcox. I have always wondered how he could do this. The division of the company in which he works is knee-deep in the bowels of the military-industrial system. It “manages complex, high-consequence nuclear and national security operations, including nuclear production facilities and the nation’s Strategic Petroleum Reserve.” In others words, it is part of the U.S. war machine, making money by helping the government kill people, just like it killed people more directly in Apollo. Thousands of people grew up in and near Apollo. They have learned what harm the corporations who employed them and their relatives and friends have done and continue to do. Men, women, and children were poisoned by that uranium fuel plant and that glass plant. Yet, for the most part, they ignore this, content to contemplate instead their “warm and fuzzy” memories, as one person put it on my hometown facebook page. And many hundreds of thousands of men and women work as managers for horrendous corporate criminals like Babcock Wilcox without ever questioning their actions. Perhaps this tells us something about what those who raise their voices in protest are up against. Including the plaintiffs challenging Babcock Wilcox. I wish them success. The author has a follow-up piece on October 20, 2012, describing how Babcock & Wilcox is attacking people who dare sue the company.